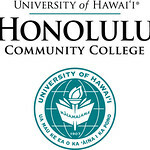 Several years ago the college acquired funding from the Diversity and Equity Initiative of the University of Hawai‘i to do place name signage for the campus. 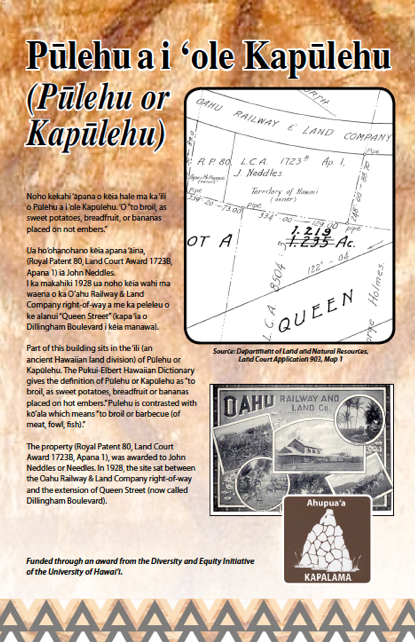 Under former Dean of University College, Ralph Kam, and Hawaiian Studies Instructor, Alapaki Luke, six place name signs were created with the help from Honolulu CC’s Design Center. According to historical land documents it was revealed that the land that Honolulu Community College occupies was divided into six ‘ili or ancient Hawaiian land divisions. Recently the signs that are written in both Hawaiian and English, have been completed and mounted on to the above identified buildings. The purpose of these place name signs is to support the work the college is doing in creating a sense of place that is culturally significant and relevant, which supports the University of Hawai’i’s Hawai’i Papa o Ke ‘Ao plan that recommends all campuses incorporate Hawaiian cultural understanding to include significant place names. It also supports the work of Honolulu CC’s Kupu Ka Wai Council and the Title III grant, Ho’ala Hou.